Back at the beginning of 2011, while still acting as mayor of NY, Michael Bloomberg has announced a plan called Vision 2020. The $3 billion plan aimed to transform New York City’s 520 miles of waterfront into a more vibrant open space and valuable resource. Bloomberg wanted a sustainable guideline that will revitalize the waterways into the city’s “sixth borough.” The 10-year plan is jam-packed with green design, addressing everything from protecting the water and improving wastewater infrastructure to expanding greenways and building new parks. Now, as the plan is taking more form and action, comes a concept plan from “Present Architecture”, a NY firm that have a Green vision of New York’s waterfronts. 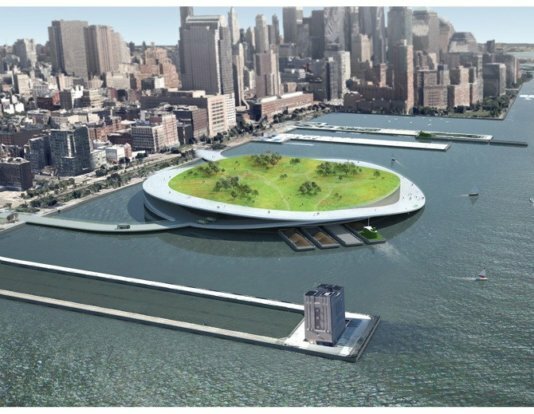 The concept is called Green Loop, and it suggests building artificial islands on the shores of the city, that function as composting parks. “New York City produces over 14 Million tons of trash every year with most of it trucked long-haul to out-of-state landfills. In a typical year, we spend more than $300 million dollars on trash transport while incurring a hefty environmental bill along the way. We send trucks millions of miles every year, creating traffic, noise pollution, and greenhouse gas emissions. All of this so that our waste can be landfilled, where it then rots and creates even more greenhouse gas. It’s a big, dirty problem”. 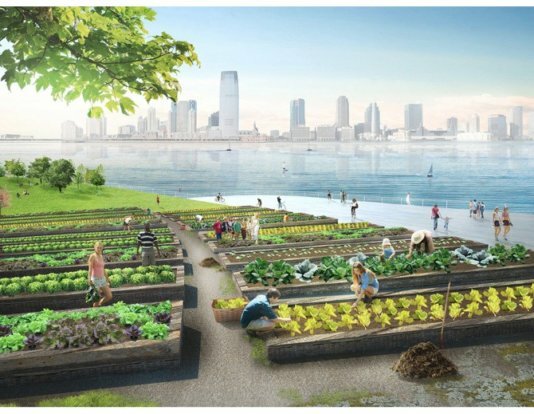 “The Green Loop is a composting hub and park, and part of a larger proposal for a network of ten waterfront composting hubs in New York City. The Green Loop has a street-level composting facility with an elevated public park on top that’s large enough to accommodate anything from educational facilities and neighborhood gardens to cross-country skiing in the winter. New York City has less open space per person than almost every major city in the country, and the Green Loop alleviates two major urban problems at once. Locating a network of Green Loops along New York City’s 520 miles of waterfront addresses three important planning issues. First, it takes advantage of the City’s existing transportation infrastructure. Trucks deliver waste a short distance to a borough composting hub, with barges and rail transporting finished compost product away. Next, having a composting hub in each borough addresses “borough equity” in our waste management. “Borough Equity” ensures that every borough is responsible for processing its own waste instead of sending the entire city’s trash to one or two over-burdened boroughs. Lastly, location. NYC needs more open space, and as part of its Vision 2020: Comprehensive Waterfront Plan, it's steadily improving public access and developing the waterfront with parks, esplanades and bike paths. A network of Green Loops links into our developing shoreline”. Though seems like an ambitious plan, Present do kill a few birds with a stroke of design. Greener cities are not just healthier; they suffer less crime, less domestic disputes and can even make you recover quicker from illness. 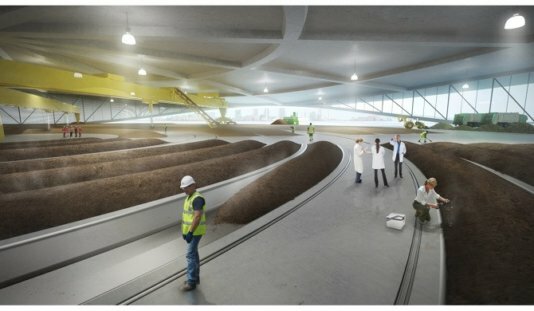 Add to that composting, as a new income for the city, and it does sound like a winner.